Este jefe es un gran Ettin que se va paseando por la zona de la forja de Grim'Batol. El combate consta de tres fases, cuatro si contamos la fase de cambio de arma. Periódicamente el jefe hace daño a jugadores aleatoriamente en pequeñas cantidades de un pisotón, por lo que no hay que preocuparse por ello. Dependiendo del arma que el jugador escoja cambiará la fase. Y escogerá un arma al azar completamente. La maza... ¡Duele! Hace muchísimo daño a su objetivo, pero su velocidad es drásticamente menor a la habitual. El tanque puede kitear el jefe para evitar ser impactado por ella. En esta fase además Throngus cargará contra un jugador de forma aleatoria y lo empalará, haciéndole una gran cantidad de daño en tiempo. Espadas... Throngus hará mucho daño, muy rápido. Básicamente se trata de sanar más y de que el tanque tire de alguna habilidad que reduzca el daño recibido. Falange... Throngus coge un escudo. Todos los ataques que le hagamos de frente serán reflejados, y la única forma de dañarle es pegarle por la espalda, así que cada vez que se gire hay que volver a redireccionarse. Para no hacer la fase tan sencilla, los cultistas aprovecharán para disparar flechas ardientes que hacen 6ks de daño de fuego aproximadamente. El combate cambia mucho en heróico. En esta ocasión, se consigue una nueva habilidad adicional: un rugido que desorienta. Se acumula 3 veces e incrementa el tiempo de lanzamiento de hechizos un 150%, pero se elimina al castear, así que cuando se tenga es bueno tirar un instantáneo. Maza... Throngrus deja un rastro de fuego por donde anda, que hace muchísimo daño. Esto significa que cuando empale a alguien y lo tire, debe huir rápidamente para no caer en el fuego. Espadas... Throngus hará daño en tiempo mágico al tanque, daño de fuego otra vez, pero se puede dispelear. Escudo... El escudo se cambiará a un dragón alado, que respira fuego y lanza 8-10ks de daño por segundo. Esto combinado con las flechas ardientes son 8ks de daño de fuego, por lo que es mortal. Asi que es bueno guardar una distancia lógica con él para poder quitarse a tiempo. This is a kiting phase as he does pretty much unhealable damage on tank, he also jumps on random player and impales them with his mace. Heroic: Throngus leaves a trail of fire, so players who get impaled need to move right away when they land. Throngus' attacks gets really fast and he may do an extra swing with his weapons. Heroic: Leaves a magic dot on tank which stacks. Every damage dealt front of him will be almost completely nullified so get behind him and attack him only then. Heroic: His shield will breath fire, which does heavy damage. In addition, untargettable archers will shoot party members from balconies. For all who wanna know how he looks and dont have Beta Keys... Here is your answer! Forgemaster Throngus! Forgemaster Throngus is a member of the race known as the Ettins. 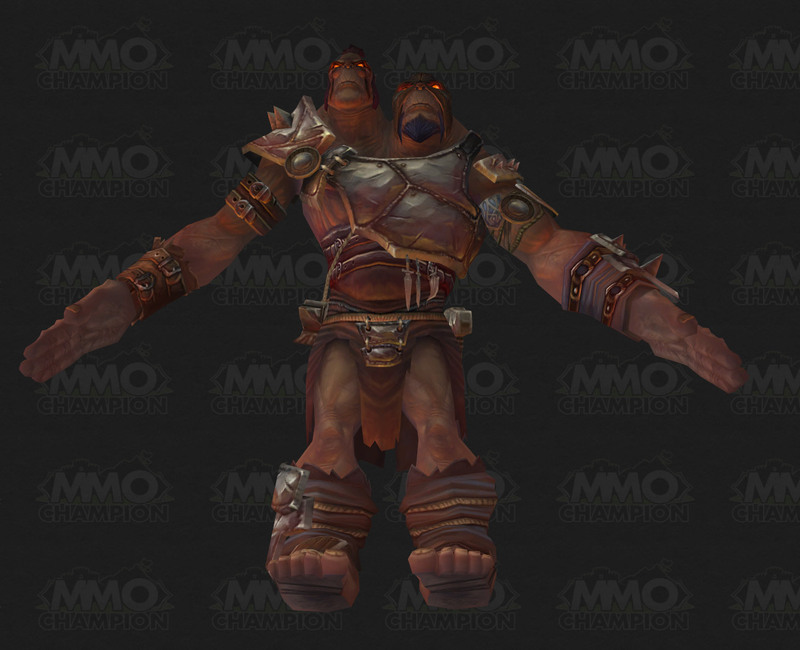 Little is known about this new race at the moment, but what we do know is that they resemble 2 headed ogres and that they are located both in the mountains around Gilneas and Lakeshire as well as Silverpine forest. The name Ettin is an archaic English cognate from the Old Norse; Jötunn. A Jötunn is a creature from Norse mythology and they are commonly called frost giants. The 2 headed giant/ogre derivation of an Ettin seems to originate from C.S. Lewis' Narnia books, primarily The Lion, the Witch and the Wardrobe. C.S. Lewis, as with his fellow Tolkien, liked to draw inspiration from Northern European Mythology and so he felt that, with a slight evolution of what an Ettin was, an Ettin was a suitable minion for the White Witch to command. It then was picked up, and more than likely the bigger part of the inspiration for the WoW developers, by Dungeons & Dragons. Ettins where first introduced in the 1977 1st D&D revision, in the same basic form as C.S. Lewis' evolution, that being a 2 headed giant/ogre. It has since remained in all major revisions of the D&D series. And that is a brief insight into what an Ettin is, and what is has been inspired by. Forgemaster Throngus is the second boss in the lvl 85 dungeon Grim Batol. He is much like Forgemaster Garfrost in the Pit of Saron, and Mr. Smite in the original Deadmines. Regular: Throngus has 3 phase, 4 if you count the "Weaponless" stage. Throngus will periodically stomp, causing a cave in on random players, this does a small amount of physical damage over time, so don't stand in it. The gimmick to his fight, is he will take out a weapon, changing the phase. What weapon he will have is completely random. Mace, "Oh, this is gonna HURT! ": Throngus will do EXTREMELY high damage to his current target, but his movement speed is drastically slowed. The tank has to kite him around, as to avoid getting hit. In this phase, Throngus will charge a random player and impale them, carrying them around on his mace and do physical damage over time. Swords, "Throngus SLICE you up! ": Throngus will hit very fast and very hard during this phase, and that is basically all I saw. Shield, "You not get through defenses! ": Throngus will take out a shield, any attacks from the front will be deflected and/or reflected. The only way to do damage, is to hit him from behind. So adjust accordingly when ever he turns around. As to not make this phase easy, twilight cultists will shoot burning arrows at the party, dealing around 6k fire damage. Heroic: The fight changes greatly on heroic, Throngus gains a new ability in addition to cave in, called "Disorienting Roar". It starts at 3 stacks, and increases spell casting time by 150%. What it means, is it will take 150% longer to cast a spell, and it is removed every time you cast a spell, even instant casts. Mace: Throngus leaves a trail of burning fire from his mace where ever he walks, the fire does an extreme amount of damage. This means when he impales someone and drops them, they have to run away as soon as they can, as he will drop them in the fire. Swords: Throngus will place a magical DoT on the tank, dealing high amounts of fire damage over time. It can be dispelled. Shield: The shield will change to a winged dragon, it will breath fire, and deal 8 - 10k damage per second. This combined with the flaming arrows, now dealing 8k fire damage, is deadly. So stand close to him so you can quickly move away. For the swords: disarm them. It helps a lot. The boss has three kinds of weapons, which will change the way the group has to behave. Dual-wielding swords: Basically doing fast hits (heavy damage) on the tank. Also causing a dispellable dot on the tank, increasing fire damage. Simply dps him from the back. Phalanax shield: Will breathe fire in 4 directions, avoid it and dps him. Mace: This is the easiest but also the most tricky one. He will hit insanely hard, but run very slow. This means the tank has to kite him. He will also charge and impale a random target. Therefor we had the group stay around the entrance from the previous room, while I kited him away from them. Doing so, the range for his impale charge became very long, and he never even got close to reaching me. DPS can chase him to keep dpsing, but be aware of the fire-trace he leaves and dont run in it. He will also stomp to cause Cave ins. Move away from them obviously. And lastly, Disorienting Roar will slow spellcasts, so healer has to be aware and keep people topped. Thanks to Sargenus for the post above, from where I stole some info. Shield Phase is the only real tough part. Dodging the initial tick or two of fire every time he changes directions can be tricky. If your tank is not fast enough to kite him out of Cave ins (or you just get bad RNG) you can have several near him when he goes into this phase, making for a very angry (and possibly OOM) healer. Blow your cooldowns during a dual wield phase and hope RNG works in your favor regarding the shield phases. Mace phase is really easy to deal with, though if he chooses it at the start DPS should be wary of threat. Most of the wipes on this boss are the result of sheer bad luck. Its not a hard fight, but when your numbers come up wrong your screwed. Might I add that Fire resistance helps a lot on this fight! Especially for when your healer gets grabbed by impale - it's fire damage that hits you and resistance mitigates it. This fight seems to be bugged atm. Adds (using some kind of spear throw) keep tearing our group apart for 8-10k dmg/2sec to every member in group for full duration of the fight. Very RNG fight on heroic. If he wants your healer to die - your healer will die, and there's nothing the party can do about it. Simply DPS him down as fast as humanly possible and hope the dice rolls in your favor. DO NOT forget to dispell the magic debuff during the swords phase. During the shield phase on heroic the radius based heals (Druid Efflorescence, Priest Holy Word: Sanctuary, etc) can be very useful as people will usually cluster up near Throngus to allow for easy movement out of the shield. Try to center these area effects on the boss such that when movement is needed by the party (shield position changes, or falling rocks) there is a good chance people will still be able to stand in them and be healed. As a Druid this might mean positioning yourself in the center of the boss model and swiftmending yourself, since the dps and tank generally hang out near the edges of the boss. A related strategy for dealing with the shield phase - the boss is very easily reset by running back into the hallway you came from. If the shield phase occurs first or maybe even second, reset the boss. Having the shield phase occur first almost guarantees another shield phase before the fight ends, and the shield phase is easily the most healing intensive. If you are really pressed on survivability, keep resetting until the shield phase occurs third for the best chance of success. If you're really having a problem with this on Heroic, just 2-heal it. the leash is sometime not active also. kited him all the way to the entrance in order to escape a wipe once. Just did this on heroic. Was kicking our buts till our ret pali decided to go to his off spec and heal. There is no enrage timer. 2 healing this makes it cake. On the shield phase it's in my experience as a healer to let the people spread around in a circle of the boss. I had groups who would move behind the boss but all at the same spot which means the fire is pretty much is garantueed to come that way when he changes direction and damages everyone. If you circle around him, not everyone has to move and not everyone is being hit by the flames as he's changing direction. Standing behind him isn't required and standing on the side works as well as long as you're not past his front. Another thing is on his dual blade phase that you don't dispel the DoT as it is applied. Removing it costs a lot of mana. Let the DoT stack to a maximum of 3 and then dispel it because as opposed to many stackable debuffs, you can remove all stacks with on dispel. Anyone else have issues during his Shield Phase where he'll bug out and just randomly start spinning in a circle, without holding his shield up spraying fire everywhere? You too, can have a shield like the Forgemaster's (though smaller). It's a Burning Crusade model: Dragonheart Flameshield. Why would someone downrate this? The shield is unique, attractive (it even breaths fire, albeit a smaller stream), and it IS the same shield model. Something that really helped my group was when he went into the Mace phase, I hit Distracting Shot as a hunter and kept my aggro high. Since I was at max range most of the time anyways, all the boss could do was walk very slowly towards me. I would then Feign Death and Misdirect onto the tank to give all the aggro back. I highly recommend two healing it if you can, the damage is absolutely insane for a single healer. I will try Fire Resistance next time, it might make this fight more doable with a solo healer. I'm curious if rogues can Dismantle his shield. I doubt it, but hey, worth a shot right? Last night we had the same glitch for 3 wipes in a row. It's similar to the sprinkler bug mentioned above but it doesn't sound exactly the same so I figured I should document it independently. When Throngus picked his shield phase, he would face a player and throw his flames as usual; but when it was time for him to change direction, he would pick up his shield, still spewing flames, and face the tank. Please note, his head and body faced the tank, but the flames still appeared to be coming from the shield, which was held at roughly a 45 degree angle from the tank (so the tank was still getting hit). When the tank moved, Throngus would follow, as though he were meleeing, but there was no melee damage - just the shield's fire and the fire arrows. He had no movement animations with the shield in this position. When we switched our spriest and healadin to holy priest and retadin, the bug didn't happen and we downed him. We speculate therefore that the bug may have been related to the spriest's Shadowy Apparitions. Does he ever drop anything but that damned agility ring? I've killed him well over a dozen times and haven't seen anything but that stupid ring drop. About the arrows on shielf phase, there's something that we can do about they? Keep walking to avoid or anything? Or it's just something for the healer heal over the arrows damage? If you want to see walkthrough of this Boss, have a look on youtube on TomcasGames (channel). Just soloed Grim Batol for the Winterfest hat. Could not find the Forgemaster. According to the map I should have been standing upon his head, but he was nowhere to be seen. Is there a trick/mechanic needed to summon him? I killed everything in sight, and moused over every object I could. Maestro de forja Throngus es el segundo jefe en Grim Batol. Es un ettin gigante y se encuentra en el Yunque de Khardros. Maestro de forja Throngus grita: Muerte... Buena elección. Quizá no ser la mejor, pero mejor que fracasar y vivir. Maestro de forja Throngus grita: ¡Oh, esto DOLERÁ! Maestro de forja Throngus grita: ¡Throngus hacerte pedazos! Pisotón poderoso – Throngus stomps his foot on the ground, triggering the walls of Grim Batol to Cave In. Throngus will not Mighty Stomp if he has his shield equipped. Derrumbamiento – After the Mighty Stomp of Throngus weakens the walls of Grim Batol, pieces of stone begin to fall on top of a random player in a 5 yard radius area. Players who continue to stand in that area take 5 Physical damage every second. Pick Weapon – Throngus has several fearsome weapons at his disposal. Periodically during the encounter, he randomly chooses between a massive Shield, a pair of Swords, or a punishing Mace. The chosen weapon grants him new abilities for a short duration of the encounter. Falange personal – Throngus points his shield at a random player every 10 seconds. Damage dealt to Throngus by a player standing in front of the shield is reduced by 99%. Flecha llameante – While Throngus has a shield equipped, archers constantly fire flaming arrows from overhead windows at random players. Each flaming arrow inflicts 6 Fire damage. Escudo flameante – A 60 degree cone of fire erupts forward from Throngus' shield, inflicting 18 Fire damage every second to any enemy target engulfed by the fire. Hojas dobles – Throngus wields a flaming sword in each hand, granting him the ability to attack simultaneously with each weapon. His melee damage is reduced by 30% during this time. Vapulear – Throngus will occasionally attack an additional two times when he swings his swords. Rugido desorientador – Throngus lets loose a tremendous roar, decreasing the attack and cast speeds of players by 50%. Players may remove this effect by casting a spell or using an ability. In Heroic Difficulty Disorienting Roar reduces attack and cast speeds of players by 150%, and each time a player casts a spell or uses an ability the amount of the reduction lowers by 50%. Llamas ardientes – The fiery blades burn the target of Throngus' melee attacks, inflicting 3 Fire damage every 2 seconds for 10 sec. This effect stacks, but a single dispel effect removes all stacks. Sobrecargado – The incredibly massive weight of Throngus' mace decreases his movement speed by 70%, but increases his melee attack damage by 200%. Embate empalador – Throngus jumps to a random target, impaling them on his mace and inflicting 7 Physical damage every 1 second for 5 sec. Zona de lava – As Throngus moves with his fiery mace, he leaves patches of fire on the ground. These patches deal 10 Fire damage every second to any player who stands in them.